I constantly keep an eye on auctions and internet sales for cars. When I find nice opportunities I usually submit them to BringaTrailer, an amazing resource that unfortunately is on the other side of the pond. Unfortunately I never made it to be "published", so I finally decided I will post here some of my future regrets. 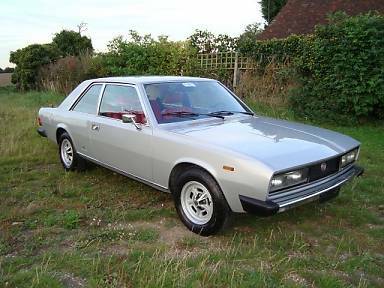 This 1974 Fiat 130 Coupe' didn't find any buyer at £4.995 and has recently been relisted for £3.995. It seems to be in very good conditions for that price and I always wanted to have one of these beauties. Only 4491 of these were ever produced and I really can't imagine how many of these still survive today. Presented at the Geneva Motor Show in 1971, it is in my opinion one of Pininfarina's most exquisite lines for a production car. Director of the coachbuilder's "Centro Stile" at the time was Paolo Martin, the same guy that gave us Dino Ferrari Berlinetta, Ferrari Sigma G.P., Alfa Romeo 33 Roadster, Ferrari 512 Modulo and many others. "Motorsport" in November 1972 described the car as "a very beautifully contrived car indeed. Just consider it! The styling, the wide fluted waistline is simple clean-cut, classic. The interior is in the best possible taste, with upholstery of velvet cord, cut-pile carpeting, and a pleated headlining, ahead of which are recessed visors. The whole aspect of the 130 is that of the refined luxury car". Even if the engine's 3235cc hardly makes this car a daily commuter, I think this could be an interesting investment at this price, even with the "noisy driveshaft /diff on the overrun" declared by the seller. Take a look at this video of someone having fun in one of these.